News just in, the sign has gone up and I can now confirm the meat auction will be taking place on Christmas Eve at 1030am. Make sure you get there nice and early for a good spot at the front. See you there! Good news, the meat auction will be taking place at the usual place and time. See you there! Rumour has it despite the building works they will be back this year. Can you believe in under 12 hours time Father Christmas will have flown round the globe delivering Christmas presents to millions of girls and boys. I for one can’t wait to see what he leaves in my stocking! Despite being one of these liberal, feminist types I do still love tradition and I think the more traditions you can hold on to the better. My favourite Christmas tradition has always been to go to the local butchers with my Dad on Christmas Eve. Last year I wrote about it extensively here. This year the butchers have expanded! Their tiny shop has been knocked through to create one large space and the fridges and freezers that used to be tucked away at the back of the shop are now just a few doors down. Unfortunately however I didn’t get to see the newly transformed butchers this year. Since moving to London I’ve had to give up a number of traditions and this was one. Instead of queuing outside the butchers in the small town of Baldock, instead I found myself dragging myself into the City for a hard day’s work. Some of you will know that I work in Farringdon, right next to Smithfield’s meat market. The market is extremely old – the current buildings go back to Victorian times but there has been a meat market on the site for hundreds of years before that. The area has buckets of character and I love seeing the butchers packing up just as I’m walking to work in the mornings. 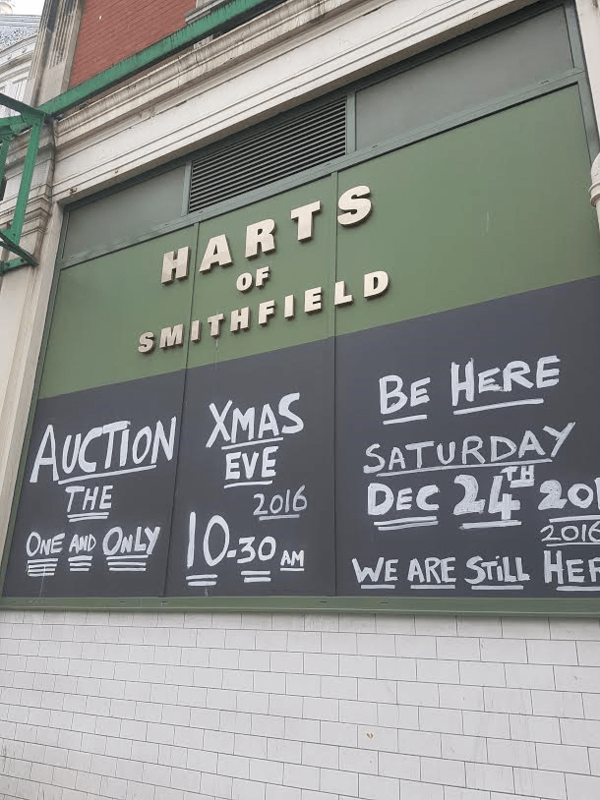 Although I wasn’t able to witness my own meaty Christmas tradition this year, I did however stumble on one that is much, much older – the Smithfield’s Annual Meat Auction held by Hart of Smithfield’s Butchers. At 10-30am every Christmas Eve they open their doors to hungry punters to flog the meat they have left. Over the past few years there has been goose, pork belly, lamb legs and more! This year was no exception. All the meat is of fantastic quality and of unrivalled value. With most joints priced at just £20!!!!!! Greg the owner puts on a fantastic show bringing out each cut and displaying it on his meat filled catwalk. The crowd go crazy every time he gives them a sneak peak of the most popular cuts – like the four rib of beef, saved ‘til the end of course! I walked past Hart’s at 9am this morning. I’d seen the sign about the auction weeks before and was amazed to see that a crowd of 50 or so people had already gathered. Nonetheless I headed into work with the intention of heading back just before 10:30am. The rules of the Smithfield Annual Meat Auction are simple. The butchers bring out a joint and they name their price. The crowd then goes wild and they proceed to hand their money over. The crowd is ten people or so deep but everyone is well behaved with the money of people standing back being passed forwards and the meat at the front being passed back. No seems to bat an eyelid putting their hard earned cash in the trust of a stranger. Today they sold Turkeys, Pork Loin, Pork Leg, Suckling Pigs, Rump of Beef, Four Rib and more! I’d had my heart set on some pork belly but I was unlucky this time. The guys are fantastic. They try to make sure everyone goes home with something and often play games with the audience. If you call a toss Greg will flip a coin. If you call it correctly the meat is yours free of charge – call it incorrectly and you pay up, but it’s still fantastic value. Although I didn’t come away with any goodies it’s a fantastic tradition which needs to be upheld. Over 200 people came along so it’s clear just how popular it really is. Unfortunately parts of Smithfield (the general market in particular) are at risk. Hart’s promise the annual auction will still go ahead next year but possibly at a location further up the road. If you want to find out more about saving Smithfields market visit the SAVE Britain’s Heritage website. Have you ever attended the meat auction? Or perhaps you have other food related Christmas traditions. I’d love to hear them! In the meantime I hope everyone has a fantastic Christmas and I hope to hear from you all in the New Year. My friend Peter and I went along for the first time this year. We had breakfast a nd a couple of pints of Guinness first to get in the Christmas spirit. We tried for the saddle of lamb unsuccessfully but did manage to get a loin of pork and a whole rump, after Greg’s team aha chopped and sliced our meat, we divided it up and came away very happy. How lovely to hear from someone else who was there 😀 we could’ve been next to each other in the crowd! I won’t be so cautious next year its such good value. See you then!